Americans use enormous quantities of water, fuel, fertilizers, and pesticides to make lawn grow vigorously, only to then spend time and money weekly to keep it short. So why, even amidst growing ecological awareness, do lawns continue to dominate our landscapes? Some reasons for lawns make sense, but lack of practical alternatives may be a major cause. If we’re ever to be weaned from over-reliance on lawns, dependable, cost effective solutions must be available. 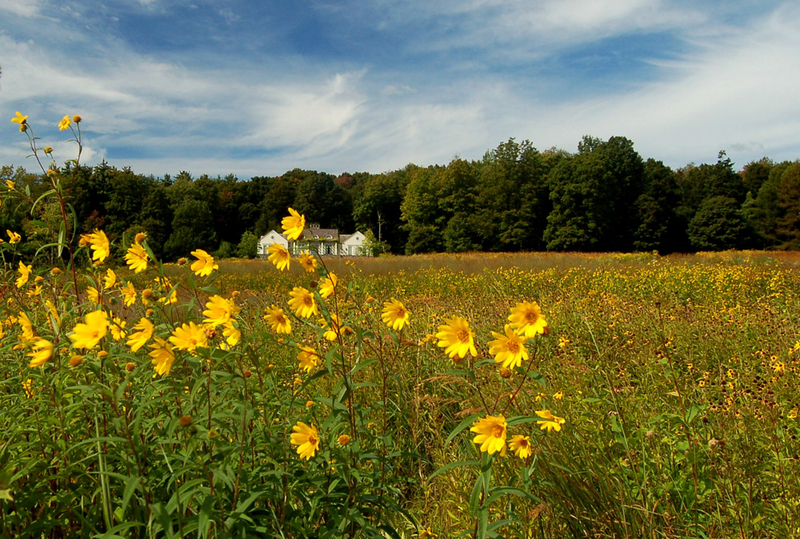 Why have wildflower meadows not become a staple of the American landscape? 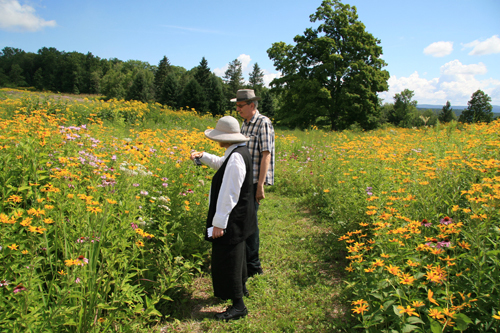 Designed meadows have been available for years and have received great amounts of publicity. Claims that they can provide a carpet of beautiful flowers, with little or no maintenance would seem to make them an ideal solution. They have not proliferated because all too often they have failed. Deficient seed mixes and poor planning have caused too many of these projects to be one year success stories which end with a massive weed invasion and a showing of the familiar horror flick, “Return of the Giant Mower”. In some cases they have failed because the expectations generated have been so unrealistic that even a success can seem to be a failure. All of this has done more harm than good, as much of the inclination and energy for change on the part of the public has been squandered. In fact, wildflower meadows, if planned, installed and managed properly, can contribute tremendously to naturalizing the American Landscape. When integrated into a well-designed landscape matrix, a meadow can help transform a residential property into a beautiful and stimulating home environment while vastly reducing quality time with a noisy mower. Large corporations can dramatically reduce maintenance costs, as has been documented on numerous projects, and public highways and parks can enhance our spectacular and diverse native landscape on a visual and ecological level. Before we begin to discuss how to obtain these results, we need to clarify what we mean by a native wildflower meadow and how it differs from the one-year wonders we have previously described. In order to fulfill the requirements of long term sustainability and low maintenance, the meadow must be designed as a functional plant community first and a flower garden second. Only by understanding and incorporating the compositions, patterns and processes inherent in our naturally occurring meadows and prairies can we create landscapes that will be viable over long periods of time without massive amounts of assistance. Does this mean that we must sacrifice aesthetics for sustainability? Not at all. True, we won’t see a wall-to-wall carpet of colors as is commonly depicted on wildflower seed packets, but we need not lower expectations, only change them. A visual foundation of native ornamental grasses glimmering in the sun and swaying in the breeze, complemented by graceful drifts of wildflowers will provide a truly spectacular scene, more inspiring and certainly more sustainable than the riot of color depicted on the seed packet. Instead of waiting in dread to see what will emerge the second year after the annual flowers have expired, we can enjoy an ever evolving natural landscape that changes from season to season, and year to year as it reflects the beauty and grace of our native meadows and prairies. Sounds very nice, right, but how do we get it done? While we are waxing poetic the weeds have something else in mind. 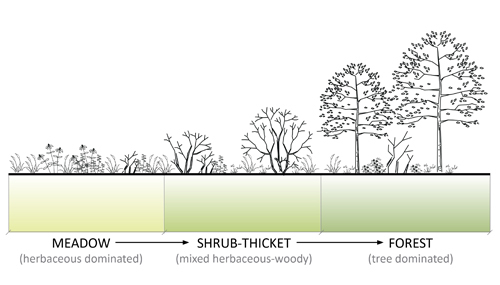 The following are some of the most important elements for designing, implementing and managing a native meadow that we can feel confident will fulfill our expectations. Analysis of the site will be the first order of business and there are four main aspects to be considered. Item number one is light exposure. 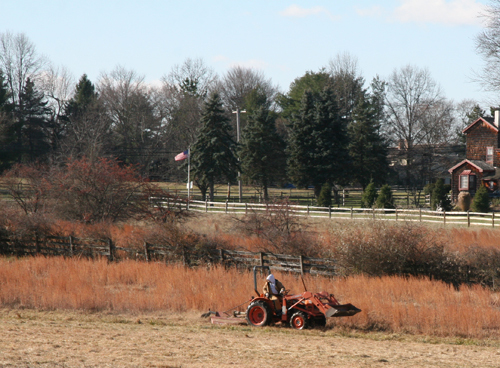 Full sun is a necessary requirement for a meadow planting. Insufficient sunlight will favor woody species over herbaceous wildflowers and grasses causing an increase in maintenance requirements. Soil type will be your next consideration. It is imperative to understand and identify which soil you are working with (sand, loam, clay, etc.) in order to select plants that will adapt successfully to the site. If poor soils exist, a decision can be made to either amend the soil or narrow the plant list to those that will tolerate that specific condition. In some cases bad soil conditions, either poorly drained or very dry, can provide a competitive advantage to the meadow species. Many of the most notorious weeds favor richer soils while there are numerous native flowers and grasses that thrive in poor conditions. Plants with strong ornamental characteristics such as Butterfly Weed (Asclepias tuberosa) and Little Bluestem (Schizachyrium scoparium) will grow well in dry sands while Pink Turtlehead (Chelone lyonii) and New England Aster (Symphyotrichum novae-angliae) will thrive and flower in poorly drained clay soils. High soil nutrient levels will be less important than in traditional landscapes as most native plants are generally adapted to existing conditions. Barring an extreme deficiency, fertilization should be avoided as it will probably favor the weeds more than the desirable species. 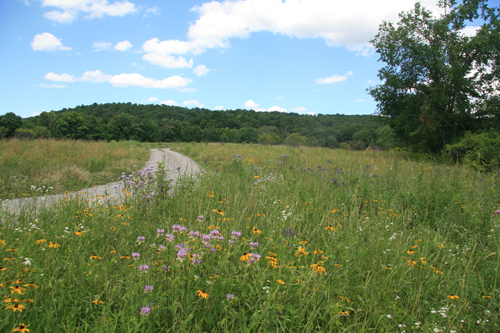 Grade and topography can effect a number of decisions to be made in planning the meadow. A north slope may not be favorable to meadow plants as they will receive less direct sunlight. If the meadow is in a low lying area and remains wet during spring thaw and rains, plants adaptable to these conditions should be selected. A sloped site may favor spring as opposed to late fall seeding to avoid washing of un-germinated, dormant seed during winter. Also micro variations within the site can be noted and considered in the plant selection and placement process in order to further match the plant to its proper environment. Analyzing existing growth on and adjacent to the site can yield extremely valuable information relating to what plants will grow well on the site and what specific weedy species are likely to be a problem. If a problematic weed is existing on or near the site it is highly recommended to eradicate it beforehand in order to avoid future infestations. Based on your analysis of the site, you can now select the plant species that will comprise your seed mix. The plants that will afford the best long term results will invariably be those that are found in conditions similar to your site and are native to your particular region. Although the temptation is great to include showy exotic species selected for their floral characteristics, their likelihood of survival is far lower. While plants which are marginally adapted to a site can often survive in a cultivated garden where competitors are eliminated through weeding, mulches and fabrics, in a highly competitive meadow planting only the most adapted vigorous plants will survive. As in most naturally occurring meadows and prairies, grasses should be a major component of the plant mix. They are the single most important component in stabilizing the meadow from both a functional and visual point of view. 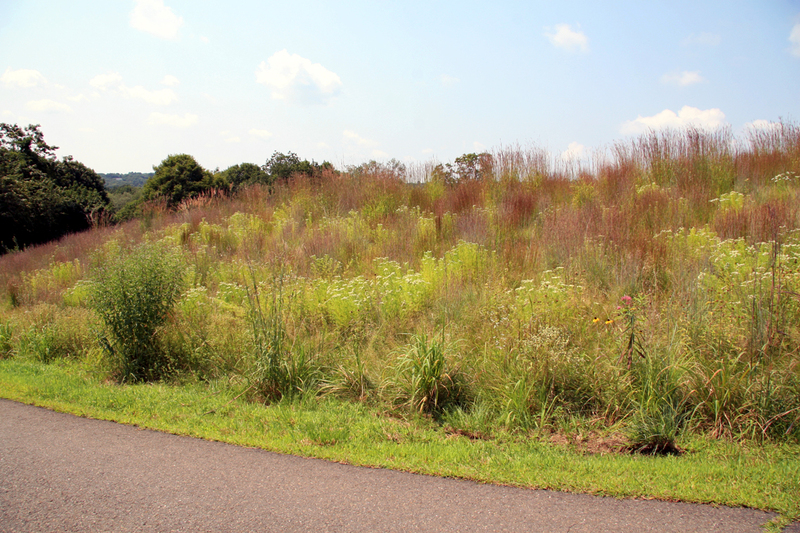 Only clump forming grasses should be used including Little Bluestem (Schizachyrium scoparium), Indian Grass (Sorghastrum nutans), and Purple Lovegrass (Eragrostis spectabilis). A nurse crop usually composed of a fast germinating, clump forming grasses such as Canada Rye or Annual Rye should also be included to help secure the site from weed invasion and erosion during the first season. This is very important. The initial phase is the most volatile as the longer lived perennials and grasses are not yet well enough established to control the site. An important concept to understand when combining plant species is the concept of niche. A study of a mature Midwestern prairie will reveal an incredibly dense tapestry where every possible space is occupied. A tiny section of five foot prairie will contain a canopy, numerous mid layers and a creeping understory. Mat forming root systems occupy the upper soil layers while deep fibrous and tap roots hold down the fort below. If all of these elements are present the meadow will have a strong capability to resist weeds. There is no place left for them to grow. In addition to filling the various niches in space, you need to fill the niches in time. (Don’t worry, I’m not getting weird on you. I have something concrete in mind). First is seasonal time. Some plants are active in warm weather while some plants are most vigorous during the cool seasons, particularly spring. By including both types there will be no seasonal opening for weed invasion. A second type of niche relating to time is measured in years. Some plants establish a cover during the first year, some during the first few years and some long lived plants may not have a serious presence for many years. All of these need to be present to avoid a weak stage in the meadow’s competitive ability. Unfortunately the vast majority of seed mixes on the market have given little or no thought to any of these functional considerations. They are mostly composed of annuals, biennials and short lived perennials that are selected for quick results at a cheap price. It is very unlikely that they will last more than a year or two. If you put Flax, Poppies and Cosmos in the ring with Canada Thistle, Japanese Honeysuckle and Oriental Bittersweet it’s not hard to guess who will be left standing after the last round. You need a far meaner crew than that to stand up to those neighborhood bullies. Even the all perennial mixes sometimes offered do not usually include sufficient long term species to make the planting competitive beyond the early stages. In other words there are perennials and there are perennials. Why is it so difficult to find a seed mix that provides the plants needed for the long haul? The answer can be found in an examination of the different reproductive characteristics of long and short lived herbaceous plants. Annuals, biennials and short lived perennials produce large amounts of flowers and seed early in life as a proliferation strategy, compensating for the fact that they won’t be alive very long. This makes their seed cheap to produce and their floral impact immediate. Long lived perennials on the other hand, planning to stick around through good times and bad, are more interested in expending their energy on early vegetative growth to gain a foothold amongst the competition. Flower and seed production is a low priority at this early stage. The bad news here is that a seed mix designed for the long term makes two years to produce flowers and will inevitably cost more. The good news is that you won’t get stomach cramps every time you receive a phone message from your two and three year old meadow clients. There is still one more item on the seed mix wish list. Even if the seed composition contains sufficient long term, competitive plants to produce a sustainable meadow, these mixes need to be available not only according geographical region (northeast, Midwest, etc. ), but by soil preference. It makes no sense to spend time determining that you have a poorly drained site containing a heavy clay soil and utilize a mix in which half of the plants are native to dry sandy conditions. Meadow mixes formulated for dry, mesic, and wet soil conditions, composed of plants native to the particular region will undoubtedly serve as the best possible foundation for a successful and efficient mix. The best route to take however is to order seed by individual species. You can further fine tune the site adaptability of your plant composition and segregate species according to micro areas within the site. There are a growing number of suppliers that offer native perennials and grasses in this form and expert advice is often an additional bonus. Individual species selection can also allow for additional design flexibility regarding the aesthetic aspects of the meadow. Consideration can include combinations of flower color and forms, foliage textures and succession of bloom as in any well planned landscape garden. In addition, plants to encourage wildlife can be included, adding another dimension to the enjoyment of the landscape. The seed heads of many of the grasses and wildflowers will attract birds to the meadow (Liatris, Rudbeckia), particularly in winter, while a number of meadow plants are particularly attractive to Hummingbirds (Lobelia, Monarda, Penstemon). 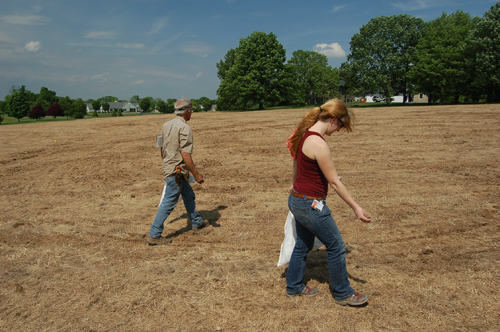 In regards to installation of the meadow, much of the process is similar to turf grass seeding. 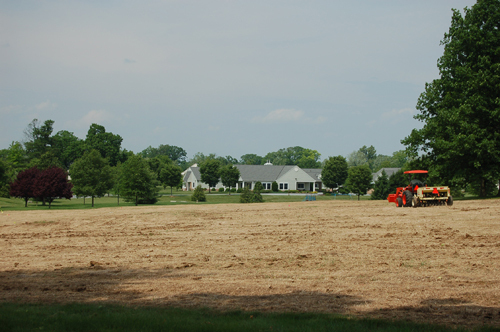 Creating a finely graded seed bed, incorporating the seed into the soil, tamping or rolling for good seed to soil contact and mulching with salt marsh hay or a clean straw is necessary. Timing can be slightly different. Sowing in the fall is limited to late dormant seeding and the spring seeding period can extend into early summer. Late fall sowing is not recommended on sloped sites where erosion can be a problem. Site preparation will be of the utmost importance in achieving a successful meadow. It begins with the elimination of existing growth. The most common methods are several repeated applications of short lived herbicide, repeated tilling or a combination of the two. Tilling will bring to the surface dormant weed seeds which must be allowed to germinate and then shallowly cultivated or sprayed with herbicide before planting. This can be avoided with a no-till seeding if a shallow seed bed can be worked up among the dead plant material. A site prepared for seeding. 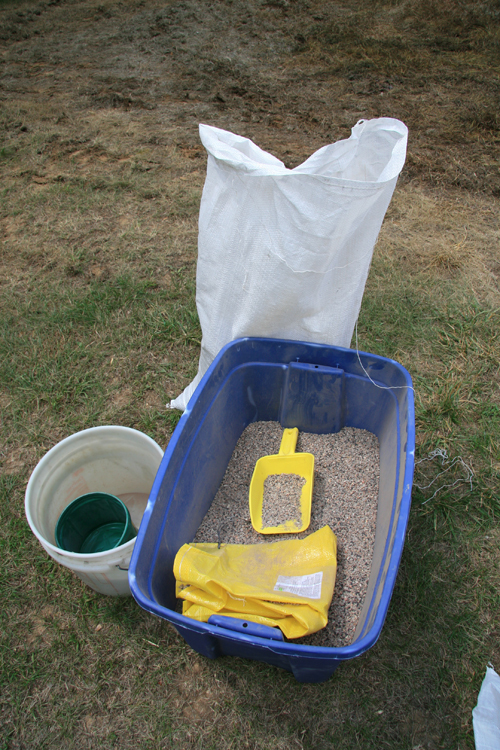 Due to the small seeding rates of the perennial flowers and some of the grasses it will be necessary to mix the seed with an inert material (sawdust, sand etc.) before spreading. Arrangement of plants in the meadow is best done by combining the designer’s creativity with the patterns that occur in nature. Naturally occurring meadows rarely have a homogeneous mix of species evenly scattered throughout the area. More commonly, an individual plant or plant group, usually including grasses, will dominate, with smaller colonies of plants occurring in pockets or drifts. Replicating this arrangement can yield a natural and appealing meadow which relies more on the form and textures of grasses interplaying with subtle touches of color, than a difficult to obtain constant explosion of bloom. Sometimes small pockets of an isolated species can correspond to a micro condition on the site such as a low moist area. By following the lay of the land in placement of plants or plant groups, you not only increase survivability of those plants, but create a landscape that automatically appears natural and graceful. Meandering paths and secluded sitting areas can be seeded with low grasses and spring ephemeral flowers (Bluets: Houstonia caerulea, Violets: Viola species) to be occasionally mowed during the season for easy access. This can allow the sights, smells and sounds of the landscape to be appreciated from within, adding an experiential element to the planting. The lines where meadow meets mowed lawn can become an additional feature of the landscape creating a graceful transition from the controlled to the wild landscape. An understanding of ‘ecological succession’ will be extremely important for the maintenance of the meadow. This is the process by which a disturbed area progresses naturally from herbaceous meadow (first annuals then perennials) to woody shrubs and pioneer trees and finally to a mature forest. In dry portions of the country various forms of prairie are the mature stage of the process. In establishing a permanent meadow where woods naturally predominate we are arresting the process of ecological development at the herbaceous perennial stage. By understanding nature’s next ‘move’ throughout the process we are better able to make intelligent decisions resulting in less maintenance requirements and a more successful end result. For a period of one to two years after planting it will be necessary to carry out a weed control program to insure the successful establishment of the meadow. The methods that will be most appropriate will be determined by the size of the project, maintenance budget, method of installation and what weed species appear. As the process of ecological succession would suggest, the first year will bring a rapid cover of annual weeds while the perennial wildflowers and grasses are slowly developing underneath.. This is to be expected, and if managed properly, is not a problem. By mowing the meadow every 6 weeks to a height of 4-6″, you will not only prevent the annual weeds from seeding, but insure that the young perennial plants growing below your mow height receive enough light for strong establishment. These perennials will emerge the following year far stronger than if they had been buried under 4 feet of annual foliage the first year. This is why the inclusion of annual wildflowers in your seed mix can be detrimental to the long term health of the planting. 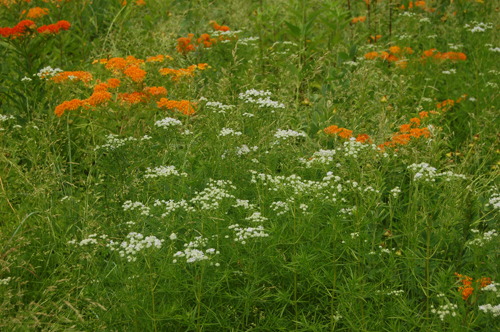 Annual wildflowers are included for their ability to bloom the first year. In order for this to occur you will be prohibited from mowing, this will allow annual weeds to go unchecked and deprive the emerging perennials of the light needed for optimal growth. During the second year the faster growing perennials (such as Black Eyed Susan: Rudbeckia hirta, Purple Coneflower: Echinacea purpurea, and Bee Balm: Monarda fistulosa) will begin to provide color and the entire planting should be well enough established to allow a decrease in weed control.You will need to monitor the planting for those weeds that can cause problems for the meadow. 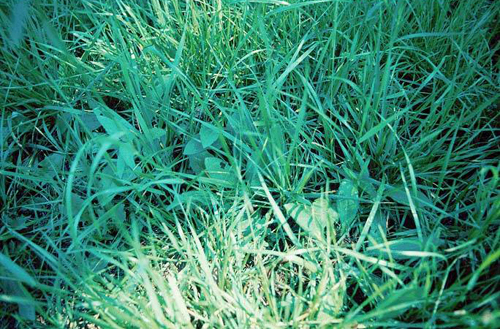 If needed, control can be obtained through spot herbicide application, manual weeding, or an additional mowing immediately following the most active growth period of the problem weed. By the third year the native meadow plants should be fairly dominant on the site and able to resist weed invasion with minimal management. Maintenance will consist of periodic monitoring and one mowing or burn either in the late winter or early spring. 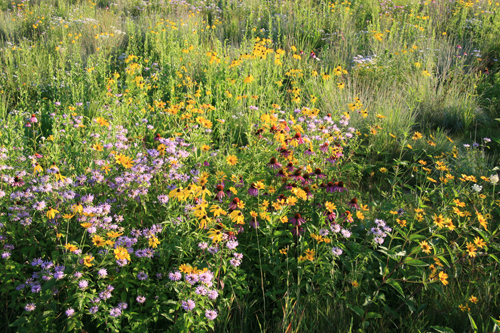 Once established, the native meadow planting exemplifies the blending of horticulture, design, and ecology and results in an easily managed, ecologically sound and visually dynamic landscape to be enjoyed for years to come. The current trend toward ecological concern, economy, and appreciation of the natural world has created a public eager for new ways to incorporate nature into their homes, businesses and public lands. Native meadow and prairie plantings blend perfectly with these emerging attitudes, presenting an outstanding opportunity for those landscape designers, architects and planners who have made an effort to understand the ecological principles needed for their successful design and implementation. Originally published in Landscape Design, Jan. 1996. Photos by Larry Weaner unless indicated otherwise. 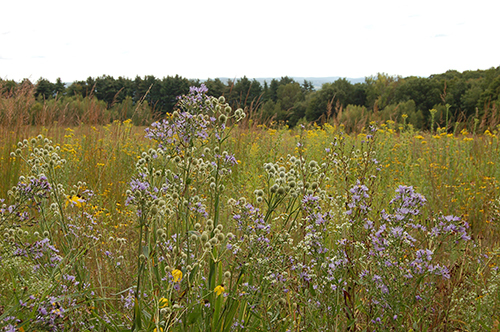 I currently have a tall native meadow – about 1/3 of an acre in Doylestown. I am having a VERY big issue with smooth leaf plaintain in vading a large swatch of the meadow. I tried using Round up ( as per Ann Rhoades suggestion) and it was not very successful. Would you be willing to come have a look? I have spent a lot of time, effort and $ trying to get this meadow established. Please call or email soon! I work during the day (but off on Tues/Wed/Sat/Sun) , so may not be able to answer the phone when you call. Thank you!! Thanks for your message about your meadow. Larry or an associate from our office will be in touch to discuss a possible site visit. Please also feel free to call our office directly at 215-886-9740. I have 1.5 acres on old tobacco farm land in Chapel Hill NC. Ihave been trying to start a meadow for two years. I tried tilling and herbicides. Total land is 2.6 acres, the rest is modern farmhouse, community garden and some lawn in front and a large pond I put in. This has been the most “sane” article I have read in a while. I want a wildflower meadow and want to start again this fall. Ihave a tractor and a John Deere mower. What I do not know is what herbicides to use that are short acting. I used one for last two years to eliminate the bermuda grass. That worked but now everthing is covered by crabgrass. I have mostly clay and some loam, flat land, drains fast, full sun. I need help finding a local meadow expert as I kind of doubt you will come down here (wish you would). I know this is going to cost money and I am prepared for that. I can also just do half the site this year. Please help. 302-824-1218. Thanks for your post on our web site. Glad you found Larry’s meadow article helpful. Due to the wide range of factors that can affect meadow design, install, and management, we can’t advise on a specific project without seeing the site in person to assess existing conditions (soils, weed pressures, solar orientation, etc.). We work throughout the eastern U.S., including within southern states, and a site visit could be arranged if you’re interested. Please feel free to contact our office with any questions. Our HOA has about 40+ acres in fields. We don’t have the $$ or labor to kill off vegetation and start from scratch. Right now it’s being mowed constantly as if it’s lawn. I’d love to see recommendations for those of us who want to do the best we can to develop as-native-as-possible meadows via less cutting but without funds to do much more than reduce mowing and planting natives as we can. Ther e must be a lot of us in this situation. (Spot herbicides on worst invasives might be feasible). Thanks for your comment. There are various strategies for planting into existing fields, albeit there needs to be an understanding of how those results will differ from seeding a native meadow. If you’re interested in a site visit, please don’t hesitate reach out to our office. As you might imagine, we can’t provide specific recommendations for an individual project without seeing a site in person to assess existing conditions, existing vegetation, weed pressures, soils, etc. Thanks again for your interest in our work and best wishes with your project! Thank you for your very helpful article. I have a 4 acre yard that I want to turn into a meadow. Do you know where I can get a list of recommended perennials, grasses and weeds for the PNW zone8a and 8b. Thanks for your message. For a list of regionally native wildflowers and grasses, try consulting a plant community book for your state (example: The Natural Communities of Georgia). Some states make these community listings available online. You might also consult the book Forgotten Grasslands of the South (Reed Noss, 2012). Native plant societies for your state or region might have helpful lists as well. Any lists will need to be whittled down based on your site conditions, availability of the seed/live plants, and establishment requirements, among other factors. Good luck with your project! One half of my back yard, which is flat with full sun , I’m about to turn into a meadow garden. 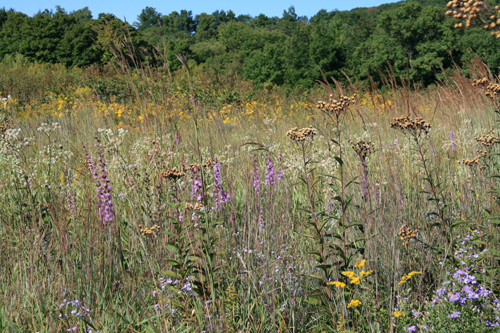 a few reasons: our drought conditions, Always liked the meadow look, also include Natives. I live in north central Kansas and purchased a fairly expensive blend of wildflower seeds from American Meadows last year. I have been working the ground for the past year. It is an old cattle lot. I don’t believe any grasses are included, only wild flowers but your article makes perfect sense. Can you suggest the grasses you would add to the mix please. I was going to set up a watering system just to get things up and growing depending on rainfall. Any suggestions are very welcome. Thank you! Hi Rebecca — Thanks for your message. We can’t make species recommendations without seeing your site firsthand and knowing more about your site’s conditions. That said, you could search out native warm season grass species that occur naturally in your area and that could be readily sourced from a quality grower. 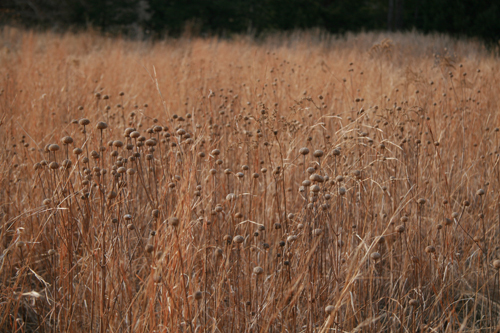 Assuming upland conditions, we would imagine that Little Bluestem (Schizachyrium scoparium) — the state grass of Kansas! — would be a major percentage of the grass component for your site. Good luck with your project!